I’ve always had a special place in my geeky heart for Power Rangers and Rita is my all-time number one homegirl. 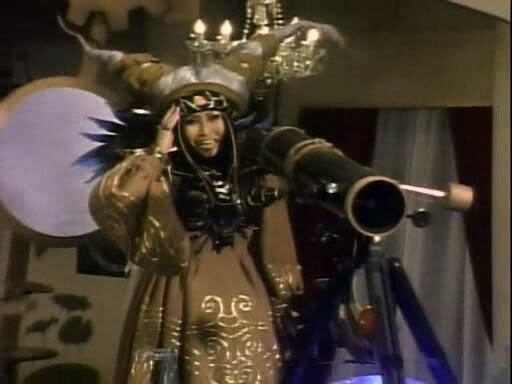 If I ever decided to do drag, I’d be Rita Repulsa—no punny name necessary, no elaborate drag outfit, I’d literally just become Rita. So you might be wondering why such a throwaway character from my childhood has stuck with me for so long and why I continue to love her. Well I can’t give you one good reason— but I can give you five. Everything from her pointy Madonna bra to her old-timey flying bicycle screams retro chic. When it comes to spying in her enemies Rita uses a simple telescope. When it’s time to send down a monster, she creates one from clay using a funky Monster-Matic machine. Her mortal enemies use magical technology and giant robotic machinery while Rita is kicking it old school. Plus, consider how skilled she has to be to throw her wand from the moon down right next to the monster of the day. While all other Power Rangers villains have had some truly bizarre ways of transforming their monsters into giant sized killing machines, Rita does it manually. In one swoop of her wand she displays that she has the strength and skill to throw your dad into orbit. Unlike most supervillains, Rita actually knows the real identities of the superheroes that she combats on a daily basis. However instead of sending the Putty Patrol down to their house in the middle of the night with a shotgun, she instead uses the art of psychological warfare to break down her enemies. After all, the Rangers know that Rita knows who they are and that it’s only a matter of time before she messes with them again. The teens can’t do a single thing without Rita ruining it—they can’t have a party, they can’t participate in school events, they can’t even make friends without Rita finding a way to turn the opportunitiy against them. And if the Ranger has a fear or insecurity, you know she’s gonna exploit it and turn it into a monster. In Season 2, Rita was given the boot by her boss Lord Zedd, who took over her palace and her entire operation on Earth. To add insult to injury, he tossed Rita back into her dumpster and sent her hurtling through space. That’s a pretty crappy way to be fired, but Rita shrugged it off like a rockstar. She rolled right back into Zedd’s palace, gave herself a makeover and slipped her old boss a love potion. 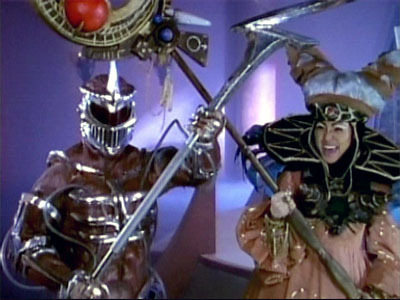 Rita ends up marrying Lord Zedd and essentially taking over once again as matriarch of their little fucked up moon family. Think about that for a second, when’s the last time you went back to a job you lost and took over completely? 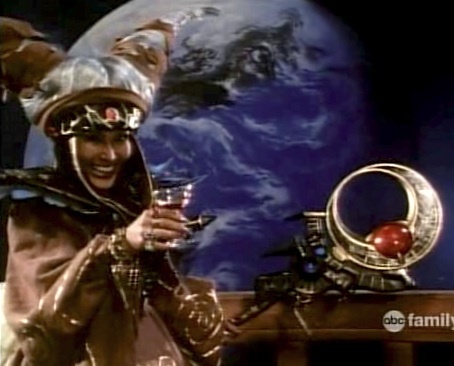 Rita Repulsa has the unique honor of being one of only a handful of female villains to serve as primary villain on a superhero show marketed to young boys. Oh sure Batman had Poison Ivy, the X-Men had Mystique and He-Man had Evil-Lyn but none of these ladies could be considered a primary villain. 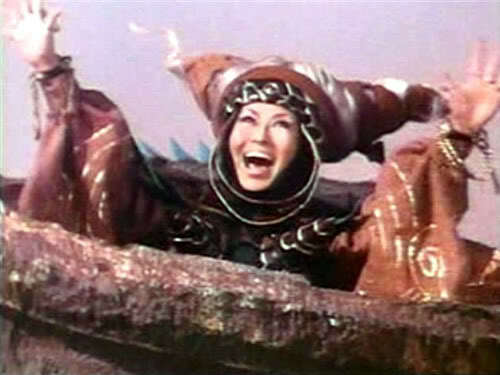 When I was a kid it was refreshing to see this little old Japanese woman posing a serious threat to the Power Rangers. Rita’s gender is never portrayed as a drawback or a weakness and she remains a terrifying and powerful force in the lives of the Rangers. Okay, so maybe Rita’s monsters were destroyed every single time she sent them after the Rangers, but while they were winning the battles, Rita was slowly winning the war. Her first major defeat comes only at the hands of her boss and it’s more of a temporary setback. Later in the series, Rita and Zedd would make way for new villains, but they would appear now and again with new plans brewing in the background. Rita would continue to threaten the Rangers until the end of Power Rangers in Space when the positive energy from Zordon’s broken tube would cure her of her wicked ways for good. 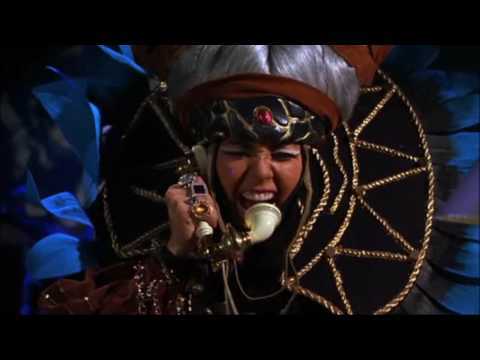 Rita later returned as Mystic Mother in Power Rangers Mystic Force, a powerful godlike entity representing all the good magic in the world. How’s that for a sweet victory? After 10,000 years and countless failed monster attacks she never gets her comeuppance and is instead to godhood. I guess it’s like Rita always used to say—it’s so good to be bad! Exactly! I was already a mom when Power Rangers began, and I could have care less about the Rangers themselves, but I watched it with my kids so I could see what Rita was up to. She was a real roll model, although it was disappointing when she became “good”.